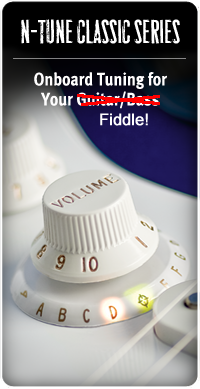 N-Tune by Zero Crossing Inc, integrates accurate, chromatic tuning into the volume knob of your electric guitar or bass'. Hmm what about a violin? I'm thinking.. Zero Crossing Inc promised to send my friend George Wharmby (Guitarist / Writer The Systematics) a replacement pot for this tuner, but never came good! So he just wanted me to remove the thing and put the Telecaster back to standard wiring. Well, standardish! It has a Bare Knuckle Humbucker fitted in the neck position, wired with a coil Tap switch. After uninstalling the faulty tuner from the Telecaster My pal kindly said I could keep it. I'm going to try to fit this tuner (Assuming that I can repair the thing first!) 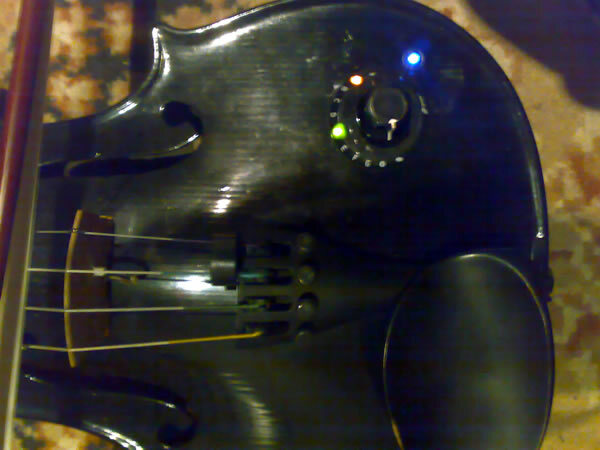 into my custom electric violin. The tuner is chromatic and according to the spec, will tune an instrument from 27Hz to 520Hz (notes A0–A7) so I don't see why it shouldn't work just fine. The only real issue is that my fiddle has a home design Piezo preamp and I would suspect that this little tuner might well be quite noisy electronically however, I will make the mod true bypass so there should be no problems..
Update: I have been trying to obtain a schematic diagram for this system directly from N-Tune (Zero Crossing Inc). In fact I have been in direct correspondence with the President (Sam Sudore) and here was the result: 'Sorry for the confusion, we are not allowed to give out our wiring diagram for IP protection purposes.' Then how the xxxx do all the big electronics companies do it? I've never had a problem obtaining schematics for hundreds of top pro-audio manufacturers. How else are we supposed to carry out a repair and service here in the UK? I was forewarned by George Wharmby that this was a Goofy company. They kept on promising to send him a replacement switched potentiometer, but it never arrived. N-Tune might even rival that dreadful Brit company, Headway Music Audio! I guess I'll have to take a couple of 12 mega pixel photos of the circuit board instead. I'll post them up on my site with a full component list when I get the chance!. I had no choice but to perform the unenviable task of repairing the original Pot! As it is an Alpha it wasn't so bad. 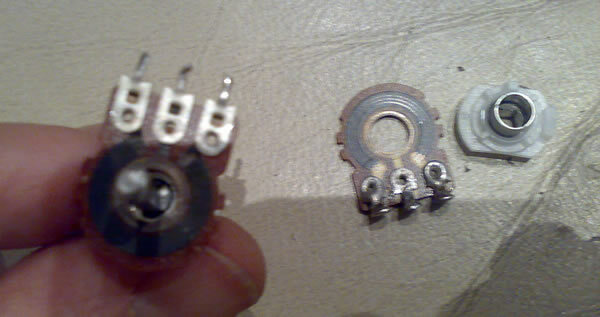 Assuming it was faulty, I decided to replace the wafer with a 10k linear taper (Out of a scrapped mixer) rather than a 250k log as was fitted, to better suit my violin's electronics.